Bollards are structures used to restrict access, improve security, and provide protection to openings in a warehouse or facility. 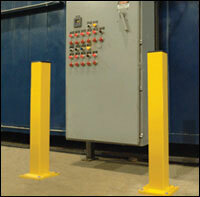 Bollards are available in a variety of sizes, colors, materials, and finish options. Safety Bollards guard valuable plant equipment, loading dock areas, parking areas, building passageways, water mains and more. The extremely durable, structural steel design bolts easily to a variety of surfaces. Column Sentry® is the original, patented column protector, saving interior building columns by surrounding them with a cushion of air. It is available in a number of sizes to fit most every column. It is highly visible in its standard safety yellow color, preventing forklift collisions. When hit, Column Sentry flexes, protecting the column, the forklift, and the forklift operator. Column Sentry is molded of low-density polyethylene, making it tough while keeping it maintenance free.